The recent pro dollar rhetoric from Jean Claude Trichet has still not managed to shift the euro vs dollar pair from their relatively tight trading range with prices continuing to oscillate between the 1.38 and 1.43 price channel. Yesterday’s doji candle was symptomatic of the indecision in the Eurodollar at present, closing the session below all three moving averages with a narrow body and wicks to top and bottom. 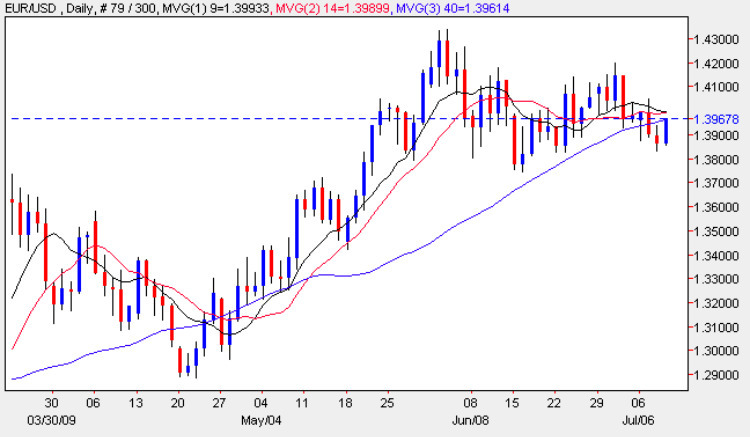 The significance of closing below the 40 day moving average is substantially reduced since all three are virtually intertwined owing to the recent sideways action and therefore cannot be used with any degree of confidence. Indeed the doji candle would suggest a price move higher this morning which indeed has occurred in the London session. This move up was largely triggered by the German Trade Balance figures which came in better than expected at 10.3bn against a forecast of 8.9bn and coupled with the ECB monthly bulletin in which Trichet indicated that inflation risks in Europe remained broadly balanced. The report was largely anodyne in content and virtually identical to the governing council’s latest policy statement. For the US later we have the weekly unemployment claims which is the major item of news on the economic calendar for today and the jobless numbers are forecast at 608k, marginally better than last week’s 614k. With very little trading opportunities in the Eurodollar at present you may be better served looking at some of the other euro crosses, and in particular the EUR/JPY which is providing some excellent trading potential.